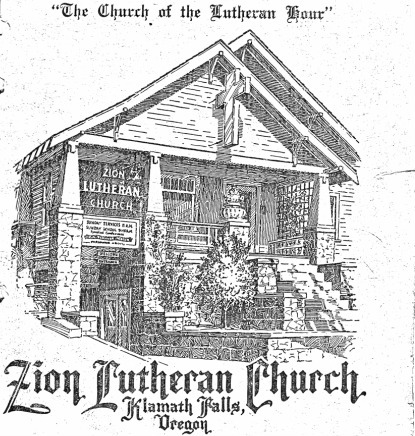 The Lutheran Church has proclaimed the Gospel in the Klamath Basin for almost 120 years. In 1893, Pastor Edward Doering began visiting the Basin preaching the truth of the Gospel. He was the first Missouri Synod Lutheran missionary in the state of Oregon—and probably the first Lutheran pastor to serve the Basin (a Norwegian Lutheran pastor would come to Klamath around 1911). Pastor Doering would take the train from Montague, California, southwest of here, through Ager, to Shovel Creek near Butte Valley. Then he would walk or catch a ride the rest of the way—more than 40 miles—to Klamath Falls. He would often end up at the Hagelstein Ranch just north of town in what would come to be called Algoma. After nine years of ministry, on horseback and riding the rails, he could count 20 Lutheran families in the Klamath Basin and wrote to the district office that they might be ready to have their own church and pastor. Pastor Doering would continue to conduct services in living rooms, baptizing and administering the Lord’s Supper, until 1917 [the 400th anniversary of the Reformation]. 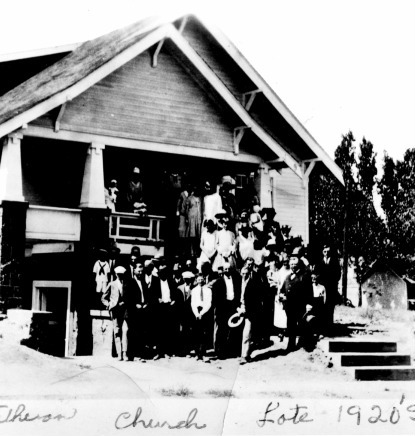 During that vacancy, numerous pastors and missionaries served the Lutherans here in the Basin, often coming from as far away as Portland. It wasn’t until 1924 that a chapel and parsonage was built on this site, on the corner of 11th and High Streets, the foundation of which sits under our offices and classrooms today. From very early on, services were conducted in both German and English. 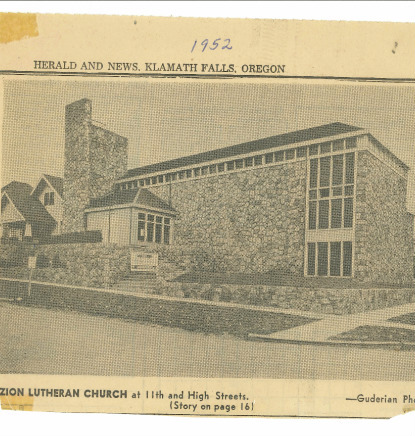 The church was officially established as Zion Evangelical Lutheran Church of the Unaltered Augsburg Confesions on 04 May 1924. 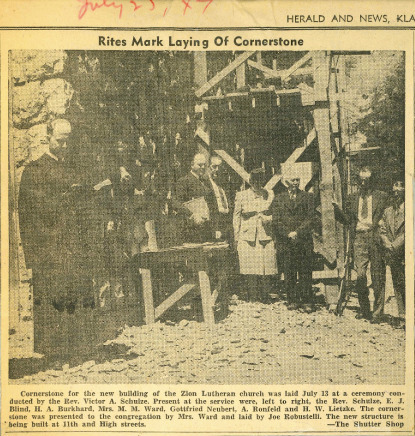 We broke ground on our current building in 1946. 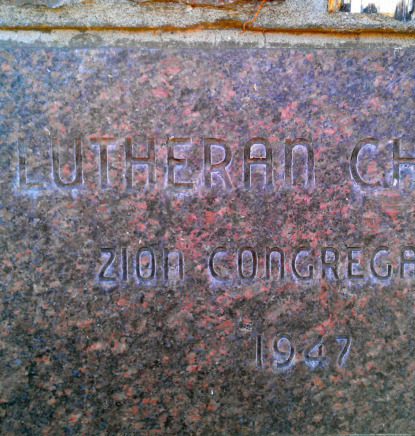 The cornerstone was laid in 1947. 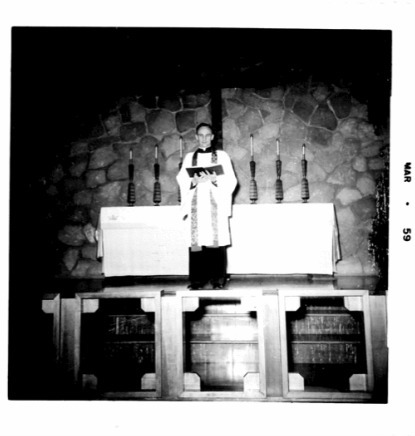 And, the first worship services were held in our new sanctuary in 1948. Our distinctive lavender and grey lava stone comes from Black Butte, California, 75 miles south of Klamath Falls.